Today’s AV system professionals face a unique set of challenges posed by integrated audio, video, and lighting systems combined with an expanding range of networking protocols and rapid advances in both hardware and software. 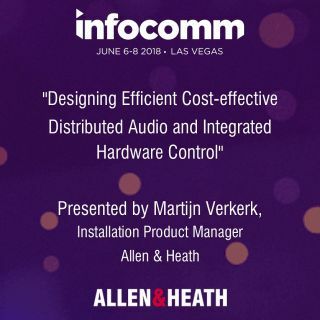 To help designers and installers meet these challenges, Allen & Heath's installation product manager Martijn Verkerk will present a special training session, ‘Designing Efficient, Cost-Effective Distributed Audio and Integrated Hardware Control,’ at InfoComm 2018 in Las Vegas, NV. Verkerk brings 25-plus years of experience in real-world integration, training and the development of audio products. His session is designed for everyone from the casual non-technical user to the experienced audio engineer. The session will present core concepts that are applicable to a wide range of products and applications from background music and corporate presentations through large scale live performances. Using Allen & Heath’s dLive Digital Mixing System as a sample platform, session attendees will learn to create scalable, distributed, integrated systems with versatile control options well suited for educational and sports facilities, houses of worship, live performance spaces, and more. “As we see Allen & Heath audio solutions placed into a wide range of facilities around the world, it was a no-brainer for us to ramp up our presence in the pro AV space and offer comprehensive training of this type at InfoComm," Jeff Hawley, marketing manager for Allen & Heath USA said.